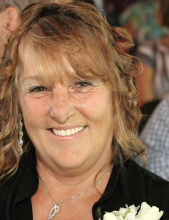 Patricia P Rhodes, 68 of Watertown, was called home on April 6th, 2019 after a long and courageous battle with cancer. It was Pat’s request that no memorial service be had, but instead friends and family are to remember the special times they had with her. Patricia was born June 9th 1950 to George (Skip) and Pearl Booth. On April 13th, 1970 she married the love of her life Philip J Rhodes Sr. In Juliet Illinois. Patricia loved spending time with family and friends, enjoying her dogs as well as spending time outdoors watching her birds and taking her dogs for golf cart rides. Patricia is survived by her husband Philip, two sons Richard Rhodes and Philip (Shelly) Rhodes Jr., both of Watertown, a granddaughter Ashley (Jake) Hein of Oconomowoc, a great granddaughter Bristol Hein, sisters; Sandra Williamson of Watertown, Shelby (Ray) Miller of Beaver Dam, brother; George (Pattie) Booth of Watertown. Patricia was proceeded in death by her parents, a sister Penny Brennecke; a brother Larry Booth; and her nephew Jasper Booth. The Rhodes Family would like to thank Rainbow Hospice Care of Johnson Creek for their services, the staff at UW Cancer center of Johnson Creek & Madison, as well as Schmutzler Vick Funeral Home. Anyone wishing to send memorials are asked to donate to the Cancer Society or the Wildlife Federation. To send flowers or a remembrance gift to the family of Patricia Pearl Rhodes, please visit our Tribute Store. "Email Address" would like to share the life celebration of Patricia Pearl Rhodes. Click on the "link" to go to share a favorite memory or leave a condolence message for the family.